After difficult Albania we needed an easy and comfortable place, hopefully easier on the eye than what we had seen over the previous days. From the border, we travelled out of a mountain rainstorm through spectacular scenery, on route to the Lefkada peninsula. A hilly island joined to the mainland by a bridge that we knew from spending a few days there in our last trip. 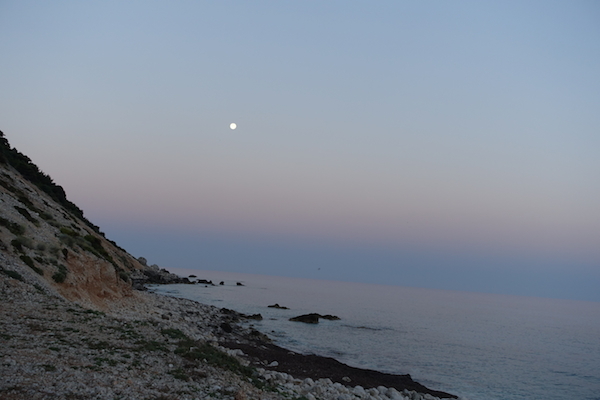 It has a beautiful coastline, several campsites and an interesting old town that we missed out exploring last time. Despite the evident lack of tourists as we travelled down the island, Nydri, a weird tourist oasis, if you are sun-worshiping lilo lover, still seemed to be thriving as we drove through – we assumed because it is built on package tourists not independent travellers who have chosen to go elsewhere this year. 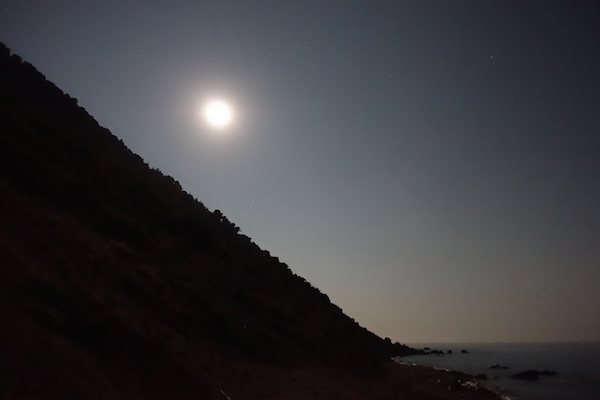 We headed towards a campsite, Dessimi Beach, hidden in a quiet little cove but still a flip flop walk from Nydri’s entertainment. This time we thought we might try the second of the two campsites in the cove. 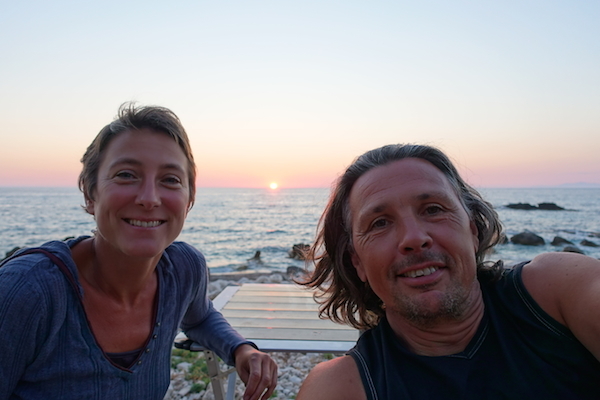 We were amazed and disappointed when we were ambushed by one of the campsite owners who was lying in wait in a café on the junction to the cove. He pursued us on his moped and herded us through to his site where a staggering number of campers huddled on the gravel and grass trying to find shade. His tactic was obviously proving successful but not for us, we made our escape as soon as we could and continued our search. Poros Beach at the bottom of a steep windy track had more potential but we were stunned at how many cars and people had taken the trouble to weave their way down the narrow track and never ending hairpin bends. 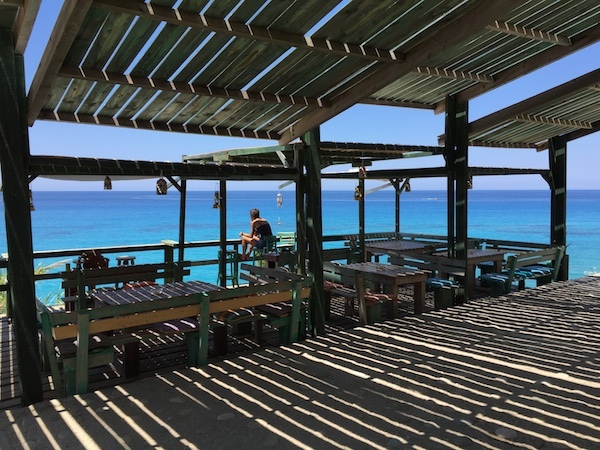 It is a beautiful place with a surprising number of check table clothed restaurants behind the lovely pebbly beach and only a handful of people in the campsite just behind the beach. As we settled down by the van to enjoy the chirrup of the cicadas in the shade of the ancient olive trees with a chilled glass of white wine, the possible cause of the near empty campsite revealed itself….a young German family who seemed unable to hear their two children as they toddled and screamed around each of the vans in turn. 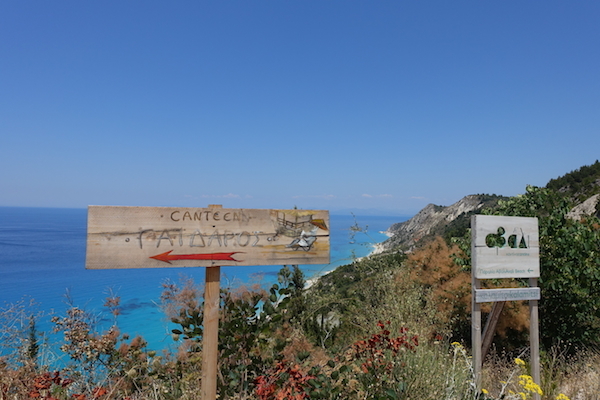 We swallowed hard, the Sancerre helped, retrieved our Lefkada map and headed out to one of the restaurants. Over a lovely dinner tucked away in a corner of the bay, once more in a restaurant for 40 but only with 4 of us there, we decided to move on. The full moon was in a few days and we wanted to find a special place to see it. 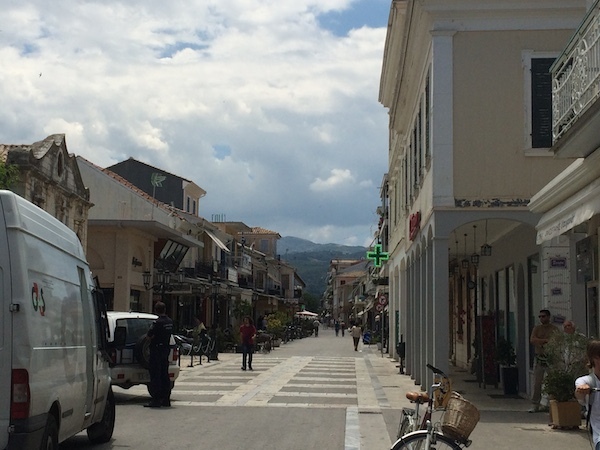 We drove the coast road to Lefkada town where we enjoyed a Gyros at a little café in a charismatic street of the old town We decided to move to another campsite 5km from town, Kariotes Beach. Almost perfect, a lovely site to accommodate probably 20 camper vans and 30 tents with a friendly owner who greeted us warmly and showed us round. I followed him into the office to check in and as he sat at his desk filling out his paper work, two swallows flew back and fore over my head, through the open door and to the corner of the ceiling where their four hungry babies poked out noisily from their nest. We picked out our nest for the evening away from the other 3 camper van guests and enjoyed a lovely evening. But when the moon arrived we could only just see it through the trees and so decided we needed to try something different if we were to see the full moon the next night. 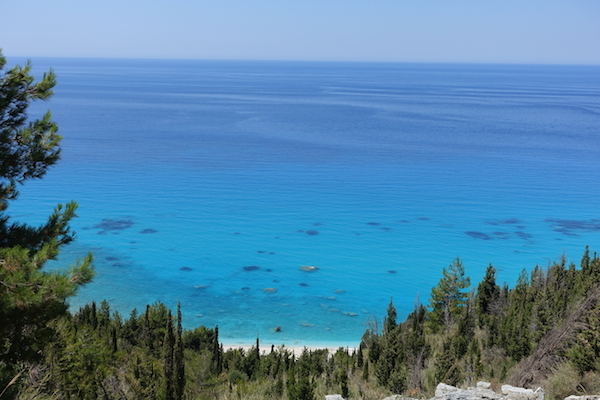 Our Lefkada map shows tracks to beaches away from towns and facilities, the first at the bottom of a long track, winding its down to the water on the stunning west coast. 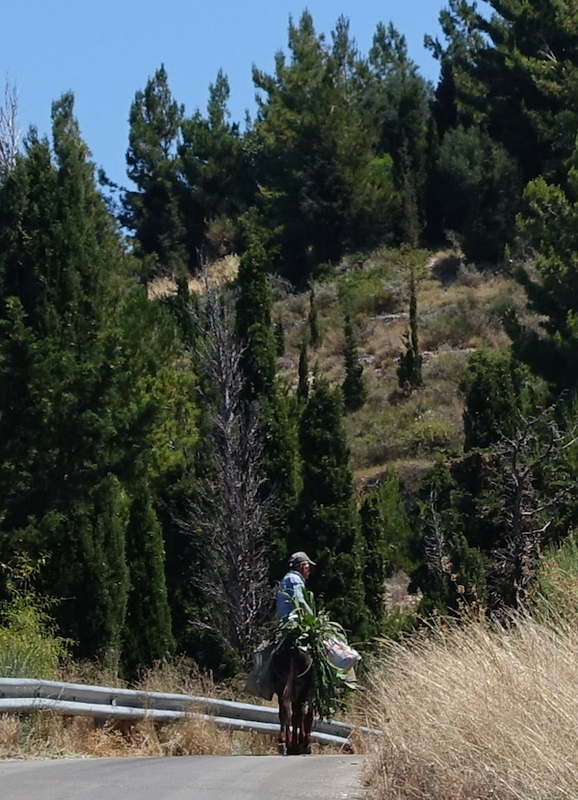 The only traffic we saw on our way down was a man on his donkey laden with grass, a good sign. When the road forked we took the dirt track hoping for fewer people and nothing spoiled, it had a sign for a café/tavern that we quite liked the look of. 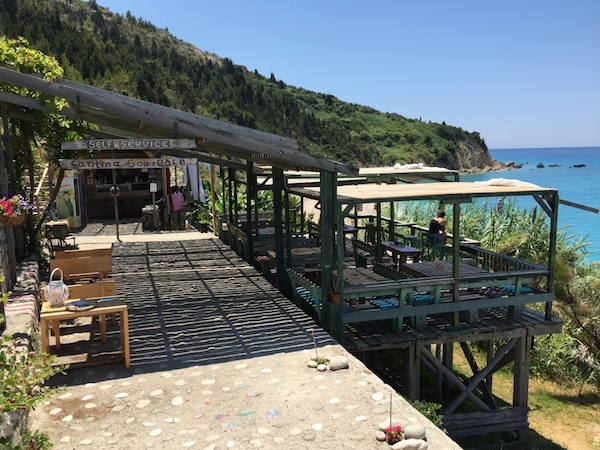 At the end of the track was an amazing place, a cool beach bar clinging to the hillside. Breath-taking views, just for us and the three guys who lived, slept and worked in this special place. 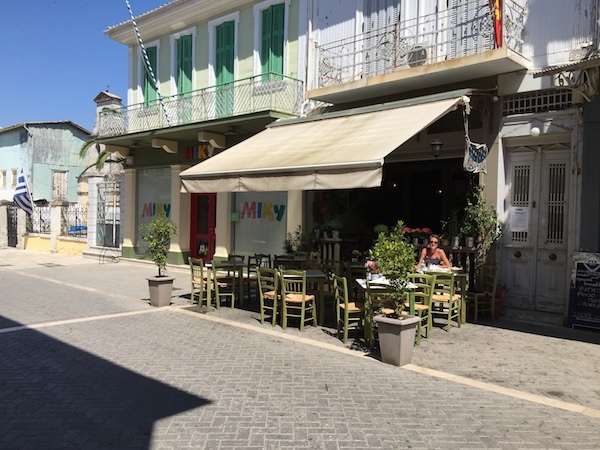 We were inspired and impressed by their creativity, style and determination and pleased to see several other people wandering into the bar from somewhere as we enjoyed a welcome Alpha Greek beer from an iced glass and pondered our next move. There were a few other people wild camping on the beach, so along with the cool bar (which they said stayed open until the last person left) meant it was a good option, however because we couldn’t find an appropriate space to park between the other people camped, it was possibly not the hide out we sought. 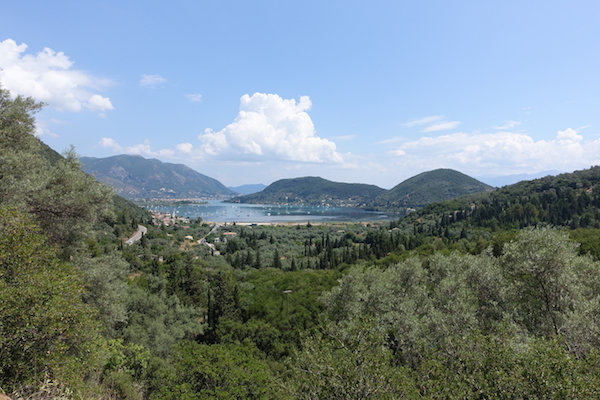 We decided to contemplate over lunch in Lefkada and headed back up, over the hills and to the old town. We also wanted to find internet to check on the news to see if any deal had been reached on the Greek ‘situation’ prior to the pending referendum. In yet another empty café in the old town, feasting on an amazing Greek salad and Skordalia (garlic & potato puree) with beetroots, we discovered no deal had been struck, banks remained closed and saw for ourselves the anxious faces in the ATM queues. We tried at several ATMs to top up our Euros and found them empty, finally succeeding after queuing at what looked like the only bank in town with money. 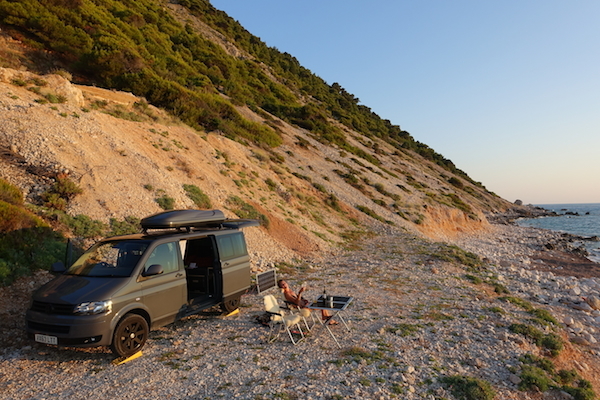 Our decision was to wild camp at the tiny pebble beach that had been a sanctuary for us on our previous visit to Lefkada. I don’t want to say exactly where it is but it is on the west coast at the bottom of a steep, narrow track and has nothing but a rocky beach and view out to sea and the sunset and hills behind. As we wound down the strangely familiar track we were both a little tense, hoping that this would still be a very special place and that we would have it to ourselves, fearing that it may have been found and spoiled by others. 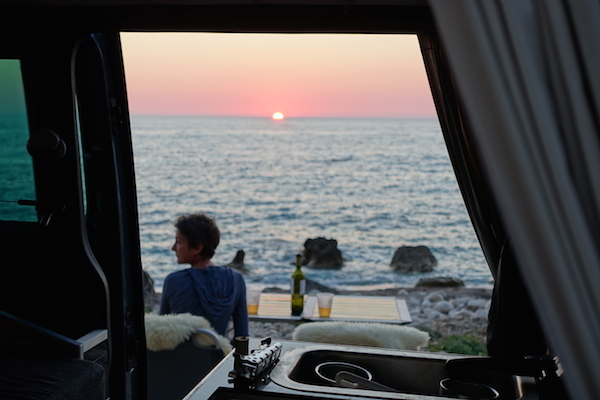 and it made us so pleased that we spent the time to convert our 4×4 transporter into a camper van to enable us to free camp and enjoy such places in absolute comfort.